What started out as a master plan desalination project has quickly turned to the use of raw brine for fracking in Sandoval County. Information obtained in IPRA request on Sandoval County role, as a public and private partnership, with Aperion ReCorp (now IMH Hedge Fund) and several other shell corporations out of Arizona. These are foreign corporations that are now ligating to see who will control the New Mexican Brackish water resources that Sandoval County appears to have given away. The market value for the water alone is said to be over $1 Billion, according to a couple of appraisals obtained. The cost of the building $87 Million with bonds that the State, Feds, and Sandoval County residents would be responsible for. But what is worse is to see how this deal was made, who is responsible for it and what we can do as citizens. How do we get accountability for money spent? How will this water be used in the future? The questionable practices to obtain funding for this project and the implication of corruption, sidestepping administrative rules calls into question the ethics of the administration of Planning and Zoning Director and the current County Manager on this project. What was to be a desalination project is now opening the door to raw brine use for fracking operation in the Sandoval County Area. Will using brine water for fracking ruin the health of our communities and drinking water in our region? In 2009 the second attempt to use the brine for oil and gas development seemed like an ecological solution than using fresh water. HB0019 passed in 2009 Sponsored By Mimi Stewart. A prior attempt to pass a vague bill in 2007 was voted down. The HB0019 Fiscal Impact Report from the Legislature can be found here. 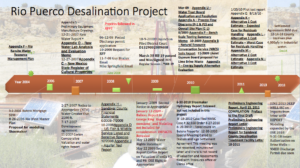 On July 30, we discovered the documents that show the interconnection between the desalination pumping in the Rio Puerco impacts on the Rio Grande. At the July 12 Work session of the Sandoval County Commission, New Mexico Tech stated there was no study they could find on transmissivity or interconnection between the two basins. Yet this study was paid for by the Interstate Stream Commission. This study was covered up and was not given to the County Commission and or the District Court or the NM Supreme Court Case that could have been much different had they known about how these impacts of pumping 18,000 – 43,000 acre-feet a year would impact the Rio Grande Compact. The reason for the discrepancy is that there are different documents that claim this ability on paper water rights and when adding up the various partners invested in IMH Financial Corporation. Impacts to Rio Rancho Water Supply has also been discussed because of the fractured nature of the geology in the area and the multiple wells planned for the project. In the July 12th Work Session the Thrust Energy experts and its CEO stated their intention of fracking on the West Mesa out Southern Blvd out to the Rio Puerco and said that their Documentation was proprietary and they were not able to show us why they thought Mancos Shales operations and oil drilling were of exceptional quality. As it stands there are no regulations on brine/brackish water and the fracking operators can drill with unpolished brine water. We believe that despite adamant denials from Gary Lee, an engineer on the desalination project, that the brine will be used for fracking. However, The authorization letter by the OSE hammers the last nail in the coffins for impacts to the Rio Grande and the ability for fracking operations to withdraw water that could pump the Rio Grande Dry. OSE Final_2018_Letter_Authorization_RG-88934. The current status of the brine wells (2) was repaired and the OSE now has authorized the record of repair of the wells. Sandoval County and IMH may now pump on those wells and selling raw brine for fracking operations. NMED is reviewing the discharge Permit for Desal project and if approved can later be modified as the waste stream on these wells impact the environment, water, air wildlife and impact the health of our communities. the Salt in the Brackish water has a 13,000 TDS (Total Dissolved Solids) that include heavy metals, Radionuclides, and arsenic just to name a few. There are Plans for selling the lime and salt waste as Gypsum Board. Sandoval County has an offer from Lhoist. According to email communication between Mike Springfield and George King, they planned to get then State Engineer to support legislation on pre-emption of the beneficial use on drilling under 2500 ft.
What pours salt into our wounds is that the brackish water will be used for Fracking the 100,000 Acres of Public and Private lands causes impacts to Shallow drinking water aquifers and causing more Emissions when we should be keeping it in the Ground. The project has been appraised at 1 billion dollars and they sold their share for $6 Million. This is putting profit before people and the Earth and is unacceptable, in light of Climate change and the human genocide.